Established in 2016 at the request of Armstrong Family, this annual award will be granted to an outstanding postdoctoral trainee or an exceptionally advanced graduate student to support a training experience at the Karolinska Institutet in Sweden, or for a Vanderbilt laboratory to host a student from the Karolinska (in alternating years). Named in honor of the late Dr. Richard Armstrong, Professor of Biochemistry and Chemistry at Vanderbilt University and Foreign Adjunct Professor at the Karolinska Institutet in Stockholm, Sweden. The research of Dr. Armstrong focused on how enzymes detoxify foreign molecules through a multipronged chemical, structural, and molecular approach. His work as a teacher, scholar, and advisor were instrumental in expertly guiding students though the rigors of Chemistry and Biochemistry. He emphasized fundamentals through his numerous lectures and selflessly served the Biochemistry community through teaching, committee membership, grant reviews, and participation in professional societies. The winner will be determined via an appointed selection committee. 2018 Winner – Linnea Nilsson, Karolinska Institute. Shown here with Martin Egli. The Chytil funds are awarded to MSTP or Ph.D. students within the Biochemistry Department. In choosing a recipient, a student’s abstract must be accepted for oral or poster presentation. Presentations may be domestic or international. A three-member committee of faculty members selects the winning recipient. The prize may only be awarded one time during one’s graduate career. This travel scholarship may be awarded annually. 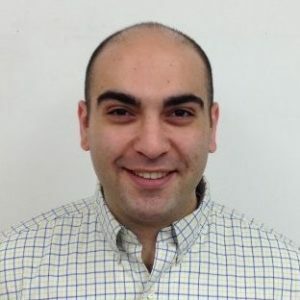 The annual John G. Coniglio Prize in Biochemistry is awarded to the medical student who has most distinguished himself or herself in Biochemistry. The Leon W. Cunningham Award is given annually to a postdoc and a graduate student in the Biochemistry graduate program who shares Leon’s commitment to excellence in scientific discovery. This award was established in 2017 at the request of the family of Professor Richard Armstrong and is supported by the fund set up in his name. 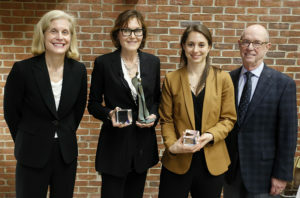 The Dr. Laura Busenlehner Award is designed to honor an outstanding postdoctoral trainee or an exceptionally advanced student whose discovery science and curiosity-driven research stands out among our excellent trainees. Dr. Busenlehner did her post-doctorate work at Vanderbilt from 2003 to 2007 in the Armstrong Lab. She went on to be an Assistant Professor at the University of Alabama in 2007, an NIH career award winner in 2009, and was named a distinguished Teacher Fellow in 2014, which is also the year in which she became a tenured Associate Professor. Regrettably, this bright scientist passed away in November of 2014. At that time, one of her students named Erin Hein stated that Dr. Busenlehner, “really pressed women in science and motivated me throughout my research.” Her studies focused on the inorganic chemistry, biochemistry, and biophysical characterization of the Frataxin protein, deciphering its role in the neurodegenerative disease Friedrich’s Ataxia. Elizabeth Gibson, a third year student in the Neil Osheroff Lab, has been awarded the 2017 AAPS Foundation Fellowship for her work on antibacterial-drug-resistant TB. 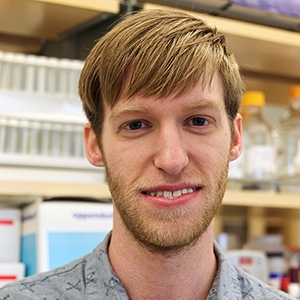 Michael Goodman was a member of the Richard Armstrong Lab in Biochemistry and is now in the Larry Marnett Lab, affiliated with the Department of Chemistry. He is the recipient of the 2017 Christopher C. Harris Travel Award for Graduate Students. Sponsored by the Eicosanoid Research Foundation, the award was presented at a conference in Mexico on Bioactive Lipids in Cancer, Inflammation and Related Diseases. Christopher Harris was dedicated administrator for the Department of Pathology at Wayne State University. Chris was a talented entrepreneur, remarkable organizer, fundraiser and meeting planner. He had a gift for bringing individuals together and making friends around the world. He was the exclusive meeting organizer for the very successful international conference on Bioactive Lipids in Cancer, Inflammation and Related Diseases which showcases the cutting edge of science on the role of lipid mediators in various physiological and pathological processes. Chris managed these conferences starting in Chicago (2003), San Francisco (2005), Montreal (2007), Cancun (2009), Seattle (2011), San Juan (2013), and Budapest (2015). The 2017 meeting in Puerto Vallarta, Mexico, is dedicated in honor of Chris Harris. Congratulations to Romell Gletten for receiving the 2017 Levi Watkins Jr. Student Award, presented annually to at least one graduate student and one medical student associated with Vanderbilt University School of Medicine who have made outstanding contributions to the institution by fostering a more diverse environment that is enriching, encouraging and embracing of all VUSM students, faculty and administration. Levi Watkins Jr., M.D., is remembered for his significant contributions toward increasing opportunities for underrepresented minorities in the sciences. A distinguished physician and researcher, Watkins was the first African American student to be admitted to and graduate from VUSM. A member of the Alpha Omega Alpha Medical Honor Society, he continued his training at Johns Hopkins and Harvard. Watkins was posthumously awarded the VUSM Distinguished Alumni Award in October 2016. Kami Prakash Bhat (Cortez Lab) is the first Vanderbilt student to win an F99/K00 predoctoral-to-postdoctoral fellow transition award from the NCI. Lorena Infante Lara, a 4th year graduate student from Neil Osheroff’s lab, was named a Spanish Language Fellow in the AAAS Mass Media Science and Engineering Fellows Program. This program assigns fellows to media sites throughout the U.S. during the summer, where they work to research, write, and report science to the general public. Lorena will be communicating with primarily Latino audiences as she writes articles for Univisión Salud (Health) in Miami, FL. 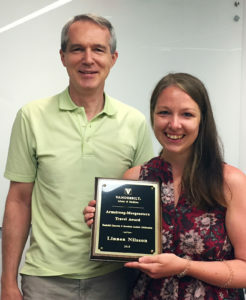 Lisa Poole of the Cortez Lab was named as the 2015 Vanderbilt Prize Scholar. This very prestigious award gives Lisa direct mentorship by Vanderbilt Prize Lecturer Dr. Huda Zoghbi (a National Academy of Sciences member and accomplished scientist). We are proud of our outgoing BSA president. Read more. Jeannie Camarillo received a 2014 1st Place Poster Presentation award during the American Chemical Society’s Division of Chemical Toxicology meeting (San Francisco) as well as an award for her Vanderbilt Institute of Chemical Biology Student Research Symposium poster. 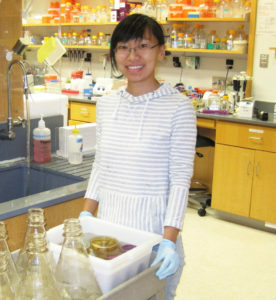 Jeannie is also the recipient of the Ruth L. Kirschstein National Research Service Award (NRSA) Individual Predoctoral Fellowship (F31) grant. Dr. Titia de Lange, the Vanderbilt Prize Winner.